I, together with 15 friends and students have just come back from Indonesia. The purpose of our trip was to visit the great Buddhist shrine at Borobudur. We arranged to stay in the Manohara Hotel which is set in the sylvan, flower-filled park around Borobudur and within walking distance of it. When we arrived we were informed that one of Indonesia’s largest Islamic organizations was having its congress in nearby Yogyakarta, that 20,000 people are attending and that many of them will probably visit Borobudur. When I heard this the slightest feeling of unease came over me. Whether or not it is justified, Islam does have a ‘scary’ image in many peoples’ minds. We had already decided to visit the shrine early in the morning so we would probably avoid the crowds anyway – or so I thought. Even when we got there at 6.30 there were already a lot of people there – all the women with head scarves and the men with taqiyahs. I had been half expecting unfriendly or disapproving looks, or at least blank stares. Nothing could have been further from the truth. Almost without exception, everyone met me with a beaming smile, an extended hand, polite inquiries about where I was from or requests to have photographs taken with me. After a while the friendliness actually became a bit overwhelming and prevented me from concentrating fully on the temple itself. Several people asked me to give them a detailed explanation of Buddhism (Good God! Is there no escape!) and one elderly gentleman took my hand on being told I was a Buddhist monk said to me, ‘You Buddhists have given we Indonesians this lovely temple. Thank you’. I also noticed that some of the visitors showed a real appreciation for the meaning of the temple, carefully examining the carved panels and looking appreciatively at the Buddha statues. It’s always good for you to have to readjust your mindset in the face of reality. My next post will deal more fully with our Borobudur trip. I really want to visit this site, and I hope I get there before they start building strip malls around it. There are at present no strip malls around this amazing temple although there is certainly plenty of commercial activity. However, touts and souvenir sellers are kept in check and as soon as you enter the huge park/garden around Borobudur all such activity ceases. Then you only have to deal with friendly, smiling Indonesians who want to talk with you and have their picture taken with you. I started to feel a bit like a ‘monument’. bhante, wonderful positive inspiration from you. sadhu sadhu sadhu. i always try to remind myself of the clingings, perceptions, pre-conditions i have from all these years of studying, being educated in formal institutions thus leaning more towards the 'western' model of thought and perceptions. and my letting go and practicing more of the bharma-viharas of compassiong, loving kindness, sympathetic joy and equanamity would slowly melt down this EGO of mine. it's always uplifting to learn from you bhante; and may more people benefit from your sharing. Bhante, looking forward for your next posting about Borobudur. 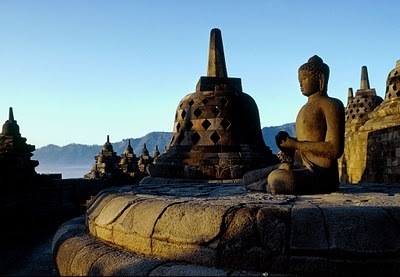 I was born and raised in Indonesia, but have never been to Borobudur, always thought of it as just another tourist spot. Now I've migrated, I missed the chance to explore my own homeland. Since I've now taken refuge in Buddhism, I definitely want to go there one day!! About Moslems, please don't be afraid of them. 90% Moslems in Indo are moderate, nice, and tolerant. Unfortunately the not-nice ones are louder than the nice ones. Wonderful post. Thank you for your blog, too. I have started to visit it every time you write a new article. This post gives me so much hope! Thank you for sharing. Hi Bhante, thanks for this beautiful write-up. It reminds me that most of my Christian friends are great ppl as well. I would love to visit the place sometime soon.